>>> Intersex Awareness Day 2015: 2 more Intersex NGO Reports filed with UN-CAT! These parliamentary questions instigated by Zwischengeschlecht.org / StopIGM.org called on the Cantonal Government to inquire about the current practice at the Zurich University Children’s Hospital, and to state their position on the non-consensual “cosmetic genital surgeries” on intersex children there. This ground-breaking parliamentary action was made possible by the repeated local, national and regional media coverage on the issue resulting from an earlier nonviolent protest outside the Zurich University Childrens Clinic and an open letter (see screengrab of news report by the national german-language TV evening news below). A further result of this initial protest targetting the clinic and subsequent talks with doctors was a ground-breaking exploratory study leading to the now-famous and much referenced publication of “Shaping parents (2013)”, illustrating how directive counselling leads to parents ‘consenting’ to mutilating treatments on their intersex children which they later often regret. The 2012 Swiss National Ethics Commission’s recommendations in a nutshell (click to downoad PDF). And after more annual protests outside cantonal university children’s clinics, again resulting in local, regional, national and even international media coverage as well as 3 more parliamentary questions, in 2010 we followed up with parliamentary questions in the national parliament, which led to the Federal Gov tasking the Swiss National Ethics Commission (NEK-CNE) to elaborate their ground-breaking 2012 recommendations, which in turn were referenced both by the UN Committee on the Rights of the Child and by the Committee angainst Torture in their 2015 statements, classifying Intersex Genital Mutilations as a “harmful practice” and “inhuman treatment”, respectively. 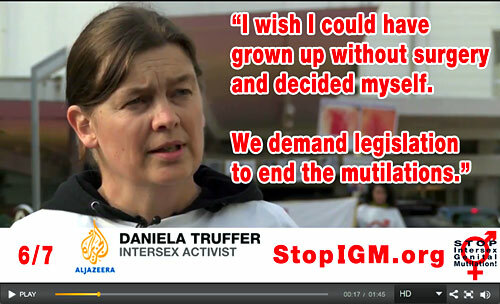 Intersex Awareness Day 2013: Protest outside Zurich University Children’s Hospital featured on Al Jazeera. Plus last but not least, after two more protests targetting the Zurich University and its Children’s Clinic calling for a historic reappraisal of past treatments including clitoridectomies, lading to more media coverage and pressure, in summer 2015 the clinic published an historical pilot study of the treatments 1913-1969, and publicly announced a regular study now taking off. 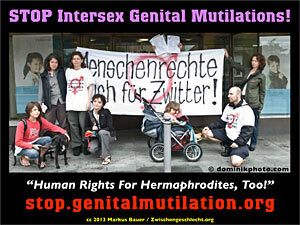 However, the Canton of Zurich still refuses to acknowledge the suffering experienced by intersex people as a result of IGM practices (as explicitly called for by NEK-CNE), and so far doesn’t consider to support the study started by the Zurich University Children’s Hospital, namely to ensure that it covers all relevant practices 1913-1969. What’s more, the Cantonal Government is still complicit in the ongoing IGM practices at the Cantonal University Children’s Hospital. Therefore, during the 26 October 2015 session of the Zurich Cantonal Parliament, Zwischengeschlecht.org / StopIGM.org will hold a peaceful vigil outside from 07:30–15:00h, to commemorate the victims of IGM practices, and to ensure that the parliament can no longer conveniently ignore its historical and ongoing responsibilities resulting from the past and current practice at its University Children’s Hopsital run by the Canton of Zurich. See you where the action is! Boston ’96 was a PROTEST! Happy 12th Intersex Awareness Day 2015! and today’s 19 Years of Peaceful Intersex Protests!